Béla Bollobás, (Cambridge) – Models of Large-Scale Networks. Vincent Beffara, (ENS, Lyon) – Pivoting points on random walks?. Jayme Luiz Szwarcfiter, (UFRJ) On self-clique and permutation matrices. 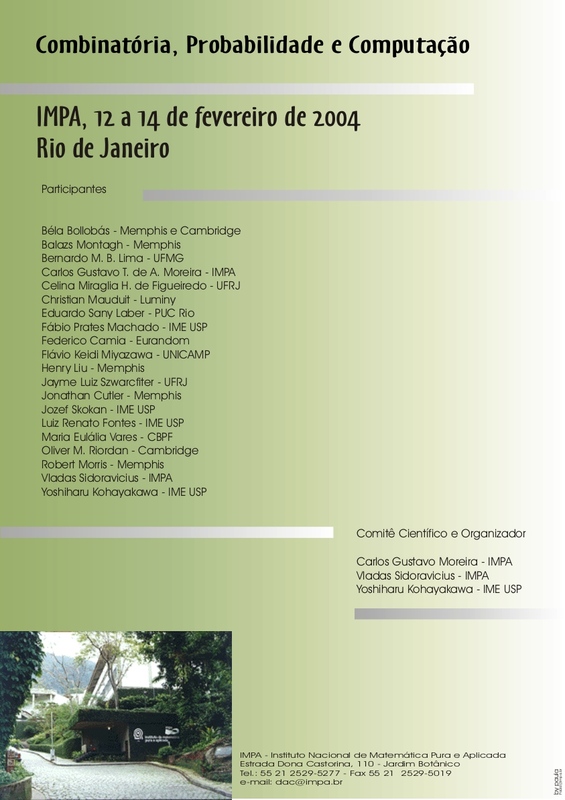 Fábio Prates Machado, (USP) raphs: complexity and approximation. Federico Camia, (EURANDOM), Continuum nonsimple loops and 2D critical percolation. Bernardo Nunes Borges de Lima, (UFMG) A note on anisotropic percolation. Luiz Renato G. Fontes, (USP) Random walks with random rates on Zd. Jonathan Cutler, (Memphis Univ.) A proof of Horak’s conjecture. Robert Morris, (Memphis Univ.) Results on Frankl’s conjecture. Béla Bollobás, (Memphis and Cambridge) Random Geometric Graphs.